← Thou art the man! On 8 August 1844 Brigham Young addressed the Saints on the topic of who should succeed Joseph Smith. While he spoke he was transfigured in the eyes of many and took on the voice, the gestures, and, to some, the features of Joseph Smith. The following are first-hand accounts from those who were witnesses to this event. They are listed in alphabetical order with the age of the individual in August 1844. I heard a voice speaking, I was surprised, and jumping to my feet, expecting Joseph the Prophet was speaking, having heard him often in public and private, so that I was quite acquainted with his voice. This was a strong testimony that the Twelve Apostles were the rightful leaders of the church and that the mouth of Joseph had fallen on Brigham Young. Sidney Rigdon one of Josephs counselors had moved to Pittsburg, and when he heard of Josephs death he came to Nauvoo claiming his right to lead the Church. At least he said the Church was 14 years old and had the right to choose a guardien, but Brigham Young, the President of the twelve Apostles and others of the twelve (that had been on a mission) just got home as the meeting was called for Rigdon to preach. And after he got through Brigham got up and spoke with such power that it convinced nearly all that were present that the Mantle of Joseph had fallen on him. I was perfectly satisfied. I was in the congregation when the Question of the succesion to the leadership of the Church was before the people and I solemly assert and testify that the last time I saw the Features. the Gestures and heard the sound of the voice of Joseph Smith: was when the form, voice, and countanance of Brigham Young was transfigured before the congregation so that he appeared like Joseph Smith in every particular. Thus the Lord showed the people that the Mantle of Joseph had been bestowed upon Brigham. The next day President Brigham Young arived in Nauvoo with some of the other apostles from a Mission to the Eastern States And Called a meeting and invited Sidney Rigdon to the Stand and in the presance of the assembled thousands of the Saints Said to Sidney Now if you have any thing to say you have the apertunity and you can take the[stand[.] But Sidney declined and kept his seat. President young then arose and took the stand his face and Countinence having the[apearanc[e] of Joseph his voice and words were the familiar voice and Words of our martered prophet so much so the[Who[l]e Congregation was fully satisfied that the mantle of the Prophet Joseph had fallen on him and some of the saints realy Believed it was in reality the Prophet[himself[.] Well do I remember the feelings that possesed my Breast at that time I knew it was Brigham Young and being familiar with the Countinance voice and the maner of the Speech of the Prophet Joseph Smith I also knew the mantle of the prophet had fallen on Brigham and it was marvelous and a mericle wrought by the Power of God in the Sight and hearing of the Whole multitude that they might never doubt that Brigham was the Chosen leader of the Church. While at the prayer meeting that was called after hearing Sydney Rigdon speak an event that gave me great strength took place. Brigham Young stood before us & as I listened to him, his countenance changed & I saw the prophet Joseph Smith & heard his voice speaking as well & I knew who was to be the next prophet of the Lord & who was to lead the Saints. Was at the meeting when[Sid[n]ey Rigdon tried to lay claim to the presidency of the Church And President Brigham Young told him different and his voice and looks was precisely like that of the Prophet Joseph. They [Joseph and Hyrum] were two good men when living, and they died good men; they died martyrs for the truth, and they sealed their testimony with their blood; and their testimony is true…. The mantle of Joseph fell on Brigham Young, the blood of the martyrs became as seed on the earth. This to my mind was one of the most critical periods in the history of the Church. A number of persons claimed the legal succession, and to have this authority, among them Sidney Rigdon, James J. Strang, Aaron and Moses Smith and others. The occasion that I now refer to was a general meeting of the Latter-day Saints, soon after the return to Nauvoo of President Brigham Young and other members of the Quorum of Twelve Apostles, from their missions. The meeting had been called to order, and after the usual opening exercises President Brigham Young arose to address the assembly. At that time I was not acquainted with President Young, but his voice, manner, expression, and in fact, his personal appearance was so strikingly that of the martyred Prophet, that I rose from my seat, as did hundreds of others, to look at the Prophet Joseph Smith Jr. The likeness was so marked that I could hardly make myself believe that the Prophet had not himself returned; not that there was a resemblance between the two men. I am not going to say why this was other than I received it, as an evidence to the people that God had chose Brigham Young as successor to the Prophet Joseph Smith Jr. There were dozens, even hundreds of others, who were impressed just the same as I was at that time, and I have heard many, many who are now gone make similar statements or expressions to that I am here making. We arrived in Nauvoo in May… there was one change more that had taken place during the time that I was out on my mission; -that grevious and hard to be borne. This was the Martyrdom of the Prophet and Seer, and Patriarch, whose voices I could not hear, declaring the truths of Heaven. But their [Josephs and Hyrums] places were filled by others much better than I once was supposed they could have been. The spirit of Joseph appeared to rest upon Brigham…. Great and mysterious are the ways of God! That week, Brigham Young and others of the 12 came to the city. On the Sunday following, Brigham and a portion of the Twelve presented themselves in our congregation. He said he had not come to electioneer, nor set up any particular claim, but to do his duty, and it was for the people to judge between truth and error. Before he [Brigham] had spoken many sentences, I discovered that it was the voice of Joseph, and had I have been where my eyes could not have beheld him, I should have believed that Joseph had been speaking. It was Josephs voice and Josephs gestures through the entire discourse, I became perfectly satisfied that it was the voice for me to follow in connection with the majority of the brethren. It was the first sound of his voice [Brighams] which the people had heard since he had gone east on his mission, and the effect upon them was most wonderful. Who that was present on that occasion can ever forget the impression it made upon them! If Joseph had risen from the dead and again spoken in their hearing, the effect could not have been more startling than it was to many present at that meeting. It was the voice of Joseph himself; and not only was it the voice of Joseph which was heard; but it seemed in the eyes of the people as though it was the very person of Joseph which stood before them. A more wonderful and miraculous event than was wrought that day in the presence of that congregation we never heard of. The Lord gave His people a testimony that left no room for doubt as to who was the man He had chosen to lead them. They both saw and heard with their natural eyes and ears, and then the words which were uttered came, accompanied by the convincing power of God, to their hearts, and they were filled with the Spirit and with great joy. There had been gloom, and, in some hearts probably, doubt and uncertainty; but now it was plain to all that here was the man upon whom the Lord had bestowed the necessary authority to act in their midst in Josephs stead. I heard Brother Brigham speak and that is the first time that I ever saw two men look and sound so much alike in all my life. And after he had sat down, I wondered where Joseph had gone. Sidney Rigdon came to the stand and tried to show to the people that he was the rightful successor of Joseph. And his arguments were so powerful that many were almost pursuaded to believe him such. But as soon as the twelve apostles with bro Brigham Young at their head took the stand it was shown conclusively where the power rested. It was the first time that I ever thought he [Brigham] resembled bro Joseph. But almost every one exclaimed that the mantle of Joseph had fallen on Brigham. For one I never had any doubts afterwards. We all soon became comforted concerning our leaders, but persecution continued all around us. The brethren were obliged to be on guard all the time. I must make mention on one [more] manifestation of the Lords goodness to me. At the special meeting held at Nauvoo after the Prophet Joseph Smiths death at the time that the mantle of the Prophet of the Lord fell upon Brigham Young. I sat listening to someone speaking with my head down, my face in the palms of my hands and my elbows on my knees. While in this position, Brigham Young came to the stand and commenced to speak with the voice of Joseph the Prophet. Being so well acquainted with the Prophets voice, I nearly sprang from my seat through astonishment, but I sat and heard the Prophets [Josephs] voice as long as Brigham Young was speaking. Not only did the voice of Brigham [sound] like that of Joseph, but the very gestures of his right hand when he was saying anything very positive reminded me of Joseph. My decision was then made as to who should lead the Church of Jesus Christ of Latter Day Saints for surely the mantle of Joseph has fallen upon Brigham. The Prophet concluded to run for the President of the United States. I was called to the State of New York on an electioneering mission to which place I immediately started where I labored untill the death of the Prophet when I received a letter from President Young calling the Elders home. I was present at the meeting which tried President Sydney Rigdon, where I plainly saw the Mantle of the Priesthood fall upon President Young with its power and spirit. The testimony of this was given to most of the congregation. After Joseph Smiths death there was some confusion as to who should be our leader. Sidney Rigdon claimed to have had a vision that he should be our head, but I, with my mother, was present at the meeting in the bowery when the mantle of Joseph fell upon Brigham Young while he was talking with the people. Mother had the baby on her knee, who was playing with a tin cup. He dropped it, attracting our attention to the floor. Mother stooped over to pick it up, when we startled by hearing the voice of Joseph. Looking up quickly we saw the form of the Prophet Joseph standing before us. Brother Brigham looked and talked so much like Joseph that for a minute we thought it was Joseph. There was no doubt in the hearts of the Saints from that moment on who was to be their inspired leader. After Brigham Young was sustained as our prophet and leader, the Church was again restored to order under his guiding hand. The Saints were anxious to complete the Nauvoo Temple, as they had been commanded by the Prophet Joseph before his death. By hard work and determination the Saints completed the temple and large numbers received their endowments there. The twelve apostles were all away from home, before they got back Sydney Rigdon wanted to call a meeting and have the people choose him for their leader the people said no wait untill the twelve comes home. Brigham Young was the first to arive after they all come home there was a meeting caled to choose a leader it was held in a grove where they held meetings in the summer time. I was there, Rigdon spoke first it did not have the wright ring to it when he sat down brother Brigham got up, the mantle of Joseph fell upon him, he was the picture of the Prophet [Joseph] and he had the Prophets voice it was a great surprise for the people, the saints was shown who was to be their leader, Rigdon left the Church went to Penn. and started a Church of his own wich soon flatened out. After the Death of Joseph and Hyrum the Excitement Seemed [?] to die away. Meantime Sidney Rigdon who was a Counsiller to Joseph arived and attempted to userpe arthority over the Church as the Succeser of Joseph but the Church was saved by the timely arival of the Twelve and the Spirit of God which always teaches right and the result was that Rigdon was cut of from the Church for his miss conduct and went up to Pittsburg followed by a few who were men as himself whose mouth was ful of cursing and biterness. The Power of the Preasthood rested down upon the Twelve backed up by the Spirit of God which enabled them to give that instruction which [seemed] to unite the harts of the Saints together as the heart of one Man. They moved forward to build the Temple. I arrived in time to hear Sidney Rigdons last lectures before the Church. President Brigham Young and others of the twelve apostles now arrived and appointed a meeting in the grove at the stand east of the temple block…. Sidney Rigdon stopped speaking. President Brigham Young stood up and commenced speaking, and all eyes were turned upon him for he seemed to have the voice of the prophet Joseph, as many testified at the time, for he spoke with great power and authority to the convincing of the Saints that the mantle had fallen from Joseph to Brigham. In a few days Sidney Rigdon came up to Nauvoo to see if the people would accept him as a guardian to act for Joseph. He told the people if they did not accept him, God would reject them as a people with their dead. He was to return to Pittsburg and God would raise up a people at Pittsburg for him. With uplifted hands he called on God and angels to bear him witness. He spoke next day to them and (to) see if the people would accept him. Just at this time came home Brigham Young and Heber C. Kimball. The morning following Brigham Young ordered the people to bring a wagon to the south side of the congregation that the people could all hear what he had to say. Brigham rose and said, “I would to God, there was not such a hurried spirit here.” He spoke with such power and the voice of Joseph sounded through him so plain that the people who could not see him, knew that it was the voice of Joseph speaking through Brigham Young. My wife Mary sitting close by me not able to turn her head asked me if that was Joseph. I told her no, but it was the voice of Joseph speaking through Brigham Young. This was a living testimony that the mantle had fallen from Joseph on to Brigham-and from this time many wanted to well off and part from the Saints-But Brigham forbid them and told them that the flock must not be scattered. Come the 24th when I arived at Nauvoo I saw thare was a gertherin of the Saints at the Stand as I drew nere I saw Mr. Sidney Rigdon [a]ddressing the Congregation I listened a few minits and Said in my hart it was not the vois of the trew Sepherd. At Nauvoo I found Sidney Rigdon busy among the Saints, trying to establish his claim to the presidency of the Church. He was first Counselor to the Prophet Joseph at the time of the latters death. The Church was fourteen years old, and he claimed that it was its privilege and duty to appoint a guardian; and he wished the people to sanction his guardianship. I was much dissatisfied with the course he was taking, and, as I could not sustain him, I felt to leave Nauvoo for a season. I went into the country, where I had left my wife and two children with my sister Melissa…. On the 8th of August, 1844, I attended a general meeting of the Saints. Elder Rigdon was there, urging his claims to the presidency of the Church. His voice did not sound like the voice of the true shepherd. When he was about to call a vote of the congregation to sustain him as President of the Church, Elders Brigham Young, Parley P. Pratt and Heber C. Kimball stepped into the stand. Brigham Young remarked to the congregation: “I will manage this voting for Elder Rigdon. He does not preside here. This child” (meaning himself) “will manage this flock for a season.” The voice and the gestures of the man were those of the Prophet Joseph. The people, with few exceptions, visibly saw that the mantle of the prophet Joseph had fallen upon Brigham Young. To some it seemed as though Joseph again stood before them. Altho only a boy, I saw the mantle of the Prophet Joseph rest on Brigham Young; and he arose lion-like to the occasion, and lead the people forth…. I saw Brother Brigham Young, of the Quorum of the Twelve, arise before the people-and I saw in him the look of Joseph, and the voice of Joseph; and it seemed to me that he was as tall as Joseph too. I knew that the mantle of Joseph had fallen on Brigham. I had heard the Prophet say from the frame that he threw the furtherence of this Church and Kingdom upon the shoulders of the Twelve; that they should bear and send this Gospel to every nation under heaven. When the Twelve returned home the Saints was troubled to know who should lead the Church; Sidney Rigdon was there from Pittsburg and wanted to choose a guardian for the Church, but when Bro Brigham arose on the stand I received a testimony for myself, he appeared to me as if it was Bro Joseph and it was Josephs voice and there the mantle of Joseph fell on Brigham. He [Brigham] said it was no enviable place to stand at the head of the people for at them the arrows of the enemy would be directed. But he was willing to stand where God placed him. The question was a general one: “What shall we do without our Prophet?” I was then 15 years of age and we all felt so sad. I was at the meeting when Sidney Rigdon arose and declared himself our true Prophet and leader. Very few responded to his declaration. I am happy to say that not one of my fathers family felt he was the right one. Soon after Pres. Brigham Young came home from the East, where he had been on a mission. I was at the meeting when the mantle of Bro. Josephs encircled him…. When he spoke, it was in Bro. Josephs voice. I arose to my feet and said to my mother: “Our prophet has come to life, mother we have Bro. Joseph back”, for there he stood as plain as I ever saw him in life; and his voice and features were truly those of our beloved Prophet. Shortly a mist seemed to pass from Bro. Brighams face and there stood brother Young talking in his natural voice, but we knew he was to be our leader. Hundreds witnessed the same thing, but not all that were there had that privilege. It was not long before Sidney Rigdon called a meeting in order to present his claims to the presidency of the Church. Some of the Twelve had returned from their missions and the day the meeting was held and while it was in session, Brigham Young (President of the quorum of the Twelve Apostles) and others slipped up to the stand and said nothing until Sidney Rigdon was through, he was standing near the center of the audience in a wagon. As the meeting was in the Boury [Bowery]. Then Pres. Brigham Young began to speak. I jumped up to look and see if it was not Brother Joseph for surely it was his voice and gestures. Every Latter Day Saint could easily see upon whom the priesthood descended for Brigham Young held the keys. Sidney Rigdon led off a few, but where are they now. They have dwindled away in unbelief and have come to naught. [After the martyrdom] we [Emily and Samuel] were summoned over the river again and went to hear what was wanted. Brigham Young then President of the twelve had returned home. The people were convened in the Old Bowry where Joseph had last spoken to the people. Sydney Rigdon made a speech and claimed to have authority to lead the Church others had similar claims. None appeared reasonable to me. The last one arose. It was the then, President of the twelve Brigham Young. He spoke to the people altogether in a different style from any of those, who had preceeded him. A crowd of witnessses arose after B. Y. had sat down and testified to the truth of what he had said. President B. Y. arose from his seat the second time and addressed the audience. I had been well acquainted with Joseph the latter part of his life. We had been at his home many times and Joseph, Hiram and families felt at home with us. [Emily writes of events leading to martyrdom of Joseph and Hyrum.] … But the God of Heaven who had said it was his business to provide for his saints, sent President B. Young home just in time, and clothed him not with “the mantle of Elijah,” but the spirit and power which had rested on Joseph. I was an eye, and ear, witness. The manner of reasoning, the expression of the countenance, the sound of the voice thrilled my whole soul. My own eyes had beheld Josephs murdered body. My own hands, had felt deaths icy coldness on his once noble forehead. I knew that Joseph was dead. And yet I often startled and involuntarily looked at the stand to see if it was not Joseph. It was not, it was Brigham Young and if any one doubts the right of Brigham to manage affairs for the Saints, all I have to say to them is this. Get the spirit of God and know for yourselves. The Lord will provide for his own. Has the word of the Lord ever failed. Br Young will not live forever clothed with mortality. But He who rules in heaven and on earth will control all things by the counsel of his own will. Saints will live. I went to meeting in the afternoon, Thanks be to Him who reigns on high, the majority of the Twelve are[her[e]. Brigham Youngs spoke and the Church voted that the 12 should act in the office of there calling next to Joseph or the three first presidents. Never can it be told in words what the saints suffered in those days of trial; but the sweet spirit-the comforter-did not forsake them; and when the twelve returned, the mantle of Joseph fell upon Brigham. When I approached the stand (on the occasion when Sidney Rigdon was striving for the guardianship of the Church), President Young was speaking. It was the voice of Joseph Smith-not that of Brigham Young. His very person was changed. The mantle was truly given to another. There was no doubting this in the minds of that vast assembly. All witnessed the transfiguration, and even to-day thousands bear testimony thereof. I closed my eyes. I could have exclaimed, I know that is Joseph Smiths voice! Yet I knew he had gone. But the same spirit was with the people; the comforter remained. We went among the congregation and President Young went on the stand. Well, he spoke; and his words went through me like electricity. “Am I mistaken?” said I, “or is it really the voice of Joseph Smith?” This is my testimony, it was not only the voice of Joseph, but there were the features, the gestures and even the stature of Joseph there before us in the person of Brigham. And though it may be said that President Young is a complete mimic, and can mimic anybody, I would like to see the man who can mimic another in stature who was about four or five inches higher than himself.-every one who was inspired by the spirit of the Lord, felt it. They knew it. They realized it. I sat myself down in the midst of the congregation, with my two wives, whom Joseph had given and sealed to me. When President Young began to speak, one of them said: “It is the voice of Joseph! It is Joseph Smith!” The exclamation of the other was,-“Ido not see him, where is[he? [“] Well the thought occurred to my mind respecting the Scripture which President Young has just quoted:-“My sheep know my voice and follow me.” Where is the one that recognized the voice of Joseph in President Young? Where is she? She is in the line of her duty. But where is the other? Gone where I wish she were not. The sheep of the good shepherd will follow the voice they know; but they will not follow the voice of a stranger. Now, this was a manifestation of the power of the Almighty-it was the power of God resting on an individual in the eyes of all the people; not only in feature and voice, but actually in stature. This is my testimony…. Did it require proof that Joseph was there in the person of Brigham, speaking with an angels voice? It required no argument; with those who feared God and loved truth, it required none. At the time our Prophet and Patriarch were killed, or at least soon afterwards, when the Twelve returned to Nauvoo, their immediate circumstances were not altogether agreeable and pleasant or profitable. But suffice it to say we had a meeting, a Conference, at which President Young was the centre of attraction. On his rising to speak, and as soon as he opened his mouth, I heard the voice of Joseph through him, and it was as familiar to me as the voice of my wife, the voice of my child, or the voice of my father. And not only the voice of Joseph did I distinctly and unmistakably hear, but I saw the very gestures of his person, the very features of his countenance, and if I mistake not, the very size of his person appeared on the stand. And it went through me with the thrill of conviction that Brigham was the man to lead this people. And from that day to the present there had not been a query or a doubt upon my mind with regard to the divinity of his appointment; I know that he was the man selected of God to fill the position he now holds. On Thursday, August the 8th, I attended a special conference in Nauvoo. Elder Rigdon addressed the assembly in the forenoon. Elder Rigdon sought, as he expressed it, the guardianship of the Church, but it was plainly manifest that the Spirit of the Lord had withdrawn from him, and that he sought that which did not belong to him. From the time the saints were driven from Missouri he had evidently been on the background, and had not walked up to his station, and on one occasion I heard Joseph Smith say that he had carried Elder Rigdon on his back long enough, and then turning to the Twelve said that if they did not help him at that time in shaking him off, the time would come when they would have to do, and that without his, Josephs assistance. And on Thursday, the 8th of August, was this saying of the Prophet brought home with weight to my mind. Elders P. P. Pratt and Amasa Lyman made some very appropriate remarks, confirming what President Young had said. . . .
President Young again arose and spoke concerning the endowments of the Elders. Said that if they did not get them in the Temple, they should have them if they had to receive them in the wilderness, for the Devil could not cheat them out of them. He then called upon the saints to know if they would receive the Twelve and let them stand in their place as the First Presidency of the Church in the absense of Joseph. The vote was unanimous in the affirmative. On this day it was plainly manifest that the mantle of Joseph had rested upon President Young. The voice of the same spirit by which he, Joseph, spake was this day sounded in our ears, so much so that I once, unthoughtedly, raised my head to see if it was not actually Joseph addressing the assembly. The assembly was dismissed by President Young after being blessed in the name of the Lord. After the Prophets death when Sidney Rigdon came to Nauvoo and spoke, he thought that it was his right and privilege to be President of the Church. President Young jumped right up on the seat and spoke. If you had had your eyes shut, you would have thought it was the Prophet [Joseph]. In fact he looked like him, his very countenance seemed to change, and he spoke like him. Of Brigham Young as President of the Church, I will again bear this as a faithful testimony that I do know and bear record that upon the head of Brigham Young as chief, with the Apostleship in full, was by the voice of the Prophet Joseph, in my hearing, laid the full responsibility of bearing of the Kingdom of God to all the world. And I do further bear this as a testimony, faithful and true, to the Church and to all the world that at a conference of the whole Church, at Nauvoo, subsequent to the Prophets death and before the return of the absent Apostles, that I sat in the assembly near President Rigdon, closely attentive to his appeal to the conference to recognize and sustain his claim as “Guardian for the Church.” And was, perhaps, to a degree, forgetful of what I knew to be the rights and duties of the apostleship, and as he closed his address and sat down, my back was partly turned to the seats occupied by Apostle Brigham Young and other Apostles, when suddenly, and as from Heaven, I heard the voice of the Prophet Joseph, that thrilled my whole being, and quickly turning around I saw in the transfiguration of Brigham Young, the tall, straight and portly form of the Prophet Joseph Smith, clothed in a sheen of light, covering him to his feet; and I heard the real and perfect voice of the Prophet, even to the whistle, as in years past caused by the loss of a tooth said to have been broken out by a mob at Hyrum. This vision, or view, although but for seconds, was to me a vivid and real as the glare of lightening or the voice of thunder from the heavens, and so deeply was I impressed with what I saw and heard in the transfiguration, that for years I dared not tell what was given me of the Lord to see. But when in later years I did publicly bear this testimony, I found that others had testified to having seen and heard the same. But to what proportion of the congregation that were present, I could never know. But I do know this, my testimony is true. The Prophets lost tooth, to which I allude, was, as generally understood, broken out by the mob at Hyrum while trying to pry open his mouth to strangle him with acid, from which time, until the tooth was replaced by a dentist neighbor, a year or two previous to his death, there had been a whistle-like sound accompanying all his public speaking which I again plainly heard at the time of which I write. And while I do know that Brigham Young, as President of the Church, was the right man in the right place, and a great leader for Israel, I still know that he never claimed to be perfect in all his ways, but that, like his brethren, he at times was liable to mistakes. At the time of the martyrdom all the Quorum of the Twelve were absent except John Taylor and Dr. Richards, both of whom were with the Prophet in the Carthage jail, and Sidney Rigdon having retained a partial fellowship as one of Josephs counselors, came forward claiming the right of Guardian of the Church. James J. Strang also claimed through a spurious revelation purporting to be through the Prophet that he should lead the Church. And so matters stood until the return of the Twelve, when a conference was assembled, and President Rigdon was called upon to put forth his claim before the people, which he did, and after closing his remarks, which were void of all power or influence, President Brigham Young arose and spoke. I saw him arise, but as soon as he spoke I jumped upon my feet, for in every possible degree it was Josephs voice, and his person, in look, attitude, dress and appearance was Joseph himself, personified; and I knew in a moment the spirit and mantle of Joseph was upon him. Then I remembered his saying to the Council of which Sidney Rigdon was never a member, and I knew for myself who was now the leader of Israel. Right here I might relate another circumstance that to me was a sufficient testimony of the truth of the Gospel. I had for years been more or less acquainted with the Prophet Joseph Smith. I had many many times heard him preach; had heard him talk with others in common conversation. I had known his voice as well as I do that of my most intimate friend…. [T]his circumstance I am going to relate happened late in the fall or early winter. The people had usually convened for meeting [in] a little grove near the temple. A bowery had been built, and seats arranged to accommodate all…. In the meantime the building of the temple had progressed; the roof was on, the windows were in, the floor was laid, but no seats arranged. It was very cold, wet Sunday and a drizzling rain. The meeting had been adjourned from the grove to the temple for there people could get shelter. While waiting for the people to gather and also for the hour of meeting, Brigham Young, Heber C. Kimball and some others of the quorum of the twelve had come to an upper room or kind of gallery and seemed to be passing and repassing an open door and window and from the position I had chosen, which was next to the wall and near the stand, I could see them very plainly, and although I knew Joseph was dead, I could scarcely make myself believe he was not there. His [Brighams] look, his motion, his walk, were precisely like that of Joseph and yet it was Brigham Young, and when he came and commenced to speak to the people his voice was like that of Josephs. In the meantime people had gathered in and standing, huddled close together, made such an immense weight on the floor that the propping under the center gave way and let the floor settle a few inches, which caused a panic among the people and some tried to rush for the door, but the loud voice of the prophet Joseph soon restored quiet and only a few were hurt by being pushed down and stepped on. No damage was done, only a few broken windows. The change of voice and appearance I could not account for only that the mantle of Joseph had fallen on Brigham Young. Now after the death of Br. Joseph & Hyrum, Sidney Rigdon having A mision appointed him by Joseph to Pittsburg before his death. Now after his death Sidney came in all the[hast[e] in him to Nauvoo from Pittsburg to claime the presidency of the church, him not knowing that Joseph Sent him out of the way to get[r[i]d of him. Now when he returned to Nauvoo he called all the people to gether to choos them a guardian, as he Expressed himself. Now, Said he, the Church is 14 years old and it was the duty of the church to choose a guardien & preached there for Two days on that subject of guardinism & the Lords way was not as mans ways, But as the heavens are hier than the earth So are the Lords ways above mans ways, etc. Just about the time that the Vote was to be taken for him to be president & guardien, But as the Lord would have the Twelve to come home & I felt to praise God to See Bro Brigham Young walk upon the stand then. [Thes[e] positive Revelations of Rigdons ware only guess So, & he thinks So & hoap so, while the lord had told him how to proseed before according to his one [own] mouth & after wards ony Suposed them so. Now when President Young arose to address the congregation his Voice was the Voice of Bro. Joseph and his face appeared as Josephs face, & Should I not have seen his face but herd his Voice I Should have declared that it was Joseph. The meeting was held according to appointment, Sidney Rigdon addressing us, giving his views upon our situation and called upon the people to choose a Guardian or trustee for the church, but there seemed to be no spirit of the Gospel in his remarks, and it was evident to all that he was not dictated by the Holy Ghost. “…While the Prophet lived, we walked by sight he is taken from us, and we must now walk by faith.” After he had explained matters so satisfactory that every Saint present could see that as aforetime the-mantle of Elijah fell upon Elisha-so also fell the mantle or the spirit and power which Joseph held in his life time had fallen upon Brigham Young as President of the Twelve, which was the hightest Quorum, and holding the highest-or first Presidency-of the Church of God upon the earth. Sad was the day that the Saints met by a call of the Apostles in a Grove, east of our beloved Temple which was unfinished, to listen to what might be said. For where was the good Shepherd? We were left alone as we thought, with none to lead us. It was a gloomy time. Sidney Rigdon talked to us and said we were of age, choose our guardian and he offered himself as that one to lead the Church but it did not satisfy the people. But when President Brigham Young arose and said to the people, “Stand still and see the Salvation of the Lord,” the Spirit of God rested upon me, and I received a testimony at that time that upon Brigham Young rested the Authority of the Holy Priesthood. Sidney Rigdon set up his Clame as Guardain of the Church-Saying that it was not of Age to do Buisness for itself being Only about 14 years of Age-and as he was the next in athoraty to Joseph -it was his Duty to act as Guardain for it untill it was Old enough to do Business for itself-on the 5th of Augast 1844 a special meeting was apointed for the Church to come together to here what he had to say upon the subject-he ocupied the time in the forenoon.-in the afternoon Presedent Young arose to reply to what he had said-and when he arose to speak I was sitting right Before Him holding down my Head-reflecting about what Rigdon had said-when I was startled by Earing Josephs Voice-he had a way of Clearing his Throat before he began to speak-by a peculier Effort of His own-like Ah-hem-I raised my Head sudinly-and the first thing I saw was Joseph-as plain as I ever saw Him in my life-and the first words he uttered whare, Right here-is the Athoraty to Lead This Church-and at the same time srikeing his hand upon his Bosam and, after uttering another sentance or two-it was Brigham Young-That was Testemony anough to Convince me where the Proper athoraty rested. Sidney Rigdon spent, what seemed to me several hours, harrangueing the people on the importance of making him their Leader, after which, Brigham Young arose and said only a word, when it was observed by the whole congregation that the mantle of “Joseph” was upon him, in word, gesture and general appearance. The people arose en-masse to their feet astonished, as it appeared that Joseph had returned and was speaking to the people. There was no longer any question as to who was the Leader. I was acquainted with the Prophet Joseph Smith, and saw him in death, and one of the strongest testimonies I ever had of the truth of this Latter-day work was when President Young got up before the people and the spirit of the Prophet [Joseph] rested upon him, and his countenance resembled the Prophet, and his voice sounded like the Prophets, so the Lord showed the people who and where the leader was for there were several clamoring as to their right to lead the church. “The mantle which our prophet wore was sought for by a half a score.” But God knew the very man so therefore it fell upon Brigham Young, and with few exceptions, the people went to their homes rejoicing and contented. It was now a matter of question with Some as to who Should lead the Church, which caused mutch comment in private circles, and many conjectures to arrise in the minds of the People, as to who was the Legitemate Successor in the Presidency of the Church. As Sidney Rigdon had preseeded the Twelve in his return from the East & claimed that it was his right, in deavering to get the People together for the purpose of rattifying his claims by their voice. But the Twelve having returned before this was accomplished Brigham Young Being the President of the Quorum appointed a special Conference of the whole Church, at which it was vissably made manifest to the most if not all present That he was chosen of God to stand in Josephs Stead in moving on the cause of[Zion[.] For as he arose & began to speak to the People he was transfigured into Josephs likeness in looks appearance & the sound of his voice so that a low whisper ran through the vast Assembly-thats Joseph-thats Joseph while the eyes of the multitude became fastened upon him with wonder & astonishment. this prodused a firm conviction in the minds of the People beyond all doubt that he was the Man and thus he was incorporated by a unaminous voice of all present with Heber C Kimble & Willard Richards as his[Councilloors[.] I being in attendence was also an eye witness to this marvelous manifestation. I have been with the Prophet Joseph and heard his instruction weekly and sometimes daily. The last time I heard him speak in public he spoke to the Legion. After telling over what he had passed thru and what he had suffered from men because he preached the Gospel of Jesus Christ, He says: from my boyhood up to the present time I have been hunted like a roe upon the mountains. I have never been allowed to live like other men. I have been driven, chased, stoned, whipped, robbed, mobbed, imprisoned, persecuted, accused falsely of everything bad. I have suffered till the Lord knows I have suffered enough. After the death of Joseph, Sidney Rigdon came and sought to place himself at the head of the church. By his flattery he deceived many. Just before he called a vote of the public congregation, Brigham Young the president of the Twelve, arrived from his mission. This was a joyful meeting. The faithful knew not that Joseph had ordained Brother Brigham and the Twelve to lead the church but they knew that the Twele were the next quorum in authority. They that served the Lord faithful were not deceived. I went to [the] meeting where the church met in the grove east of the Temple where President Brigham Young arose and spoke and behold he spoke with the voice of Joseph. The very moment I heard him speak (august 8th) I thought of Joseph and from that time on his voice sounded like Josephs and from that time the church generally were satisfied that the mantle of Joseph was on Brigham. Notwithstanding all this, Sidney Rigdon, James J. Strang, Lyman Wight, James Emmet and others led away many people from the church. At this time the mob expected we should rise and give them battle; we thought best not to do it. We just kept still and continued our work on the Temple, finished it and got our[End[owments]. But at that time most of the 12 were absent on missions. Sidney Rigdon, who aspired for the Presidency came and called the church together and presented his claim for the Presidency. But the 12 soon came home and appeared on the stand at the day appointed for choosing. Sidney made his plea. Brigham Young began to speak and at that time I sat with my back towards the stand as did many others. And when Brigham spoke he spoke with the voice of Joseph and we turned around to see Brigham speaking in Josephs voice and behold Josephs mantle had fallen on him. The people understood it in the same way. Brigham stood at the head of the Twelve therefore the church turned to him. Upon the return of the Apostles and Elders a meeting was called and by a unanimous vote Brigham Young was chosen President as he stood on the stand he said he felt as though he would rather sit in sack cloth and ashes for a month than appear before the people. But then loneliness seemed to require somebody to step forward and he felt constrained to do so. And we knew he was [to be president] because he had the voice and manner of Joseph at the time as hundreds can testify. 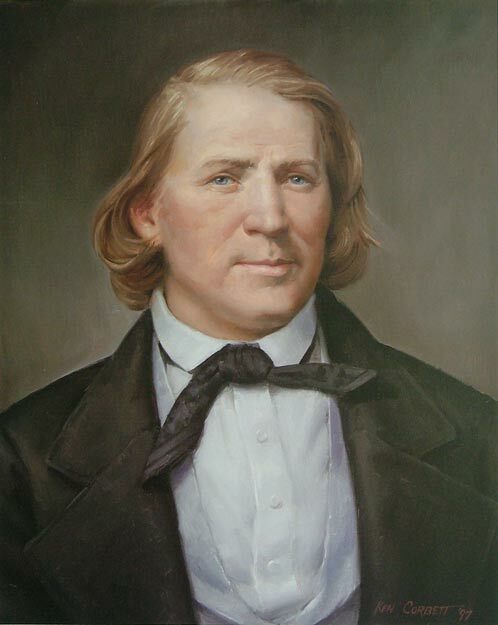 After his [Josephs] tragic death I attended the meeting at which President Brigham Young addressed the Saints, and saw his face illuminated and appear as the face of Joseph while the voice of Joseph seemed to address the people through the mouth of Brigham. I can never forget the divine thrill that passed through the audience on that occasion and the impression that the appearance and voice of Joseph produced upon his hearers. Well, the time came when the Twelve returned to Nauvoo. They called a meeting in the Bowery, and Sidney Rigdon with all the eloquence possible for a man to have, spoke for one hour and a half, but when he sat down, Brigham Young got up, and I testify to you in all fervor, before God, that the mantle of Joseph Smith fell upon Brigham Young. It was Josephs voice; absolutely Josephs voice and manner, as Brigham Young addressed the people and told them who should be their leader. Now this is no fiction; this is true as I stand here after so many years, passing from the year 1844 up to the present time. They were children as it were; and when the man of God, as the people knew him, was taken away they did not know what would become of them. That was the condition we were in-sorrow and anguish for the loss of that man. I said the people were all children. But they knew the shepherds voice. Sidney Rigdon and the others said, “I am the man, I am the man” but it did not take. The sheep knew better. And when the Twelve returned from the east, I shall never forget in this world or in the world to come the scene as Brigham Young arose after Sidney Rigdon had used up an hour and a half delivering an eloquent discourse. When Brigham got up the mantle of Joseph Smith fell upon him. It was Josephs voice; it was Josephs appearance, and I testify to you, if I never again do so on this earth, in the presence of God and angels, that this is verily the truth. This is true-that the mantle of Joseph did fall upon Brigham Young and the people knew it. Sometime during this week in August Sidney Rigdon returned and called the people together to listen to his oratory and special claims. I heard all his discourses and they were lengthy and to the point that the father of the church was dead and needed a guardian and that he was the man to fill that position. But on the 8th of August the apostles appeared on the stand, having very recently returned from the east. And to me it was a sensation. President Brigham Young arose to sepak and every eye was turned towards him, and as he spoke I fancied it was the prophets voice speaking through him, I scarcely remember much that he said in the way of reasoning, but the ring of his voice will never cease from my memory as he uttered aloud the words, “If you wish to know who is the president of the church of Jesus Christ of Latter-Day Saints it is I.” Historians have given his remarks in full, but I merely write from memory. I also remember his coupling with the motion to sustain the twelve apostles as the presiding authority of the church, the further carrying out of the measures of the prophet in finishing the building of the temple and giving the people their endowments. The votes for these measures were given heartily, for the sheep know the shepherds voice, and a stranger, or one weakened in time of trouble they would not follow. I was present at the meeting held in Nauvoo on the occasion when President Young assumed leadership of the Church, and can testify with hundreds of others that he spoke by the power of God on that occasion and that he had the very voice and appearance of Joseph Smith. I was present upon the occasion when the Twelve Apostles with Pres Brigham Young at their head, took the presidency of the church by the unanimous vote of all Israel there assembled and personally witnessed the supernatural power shown through Brigham Young. And was firmly convinced that he was the legitimate successor to the Martered Prophet. And was as ready and willing from that moment to obey his council, and receive his Revelations, as I was those of Joseph Smith. After this [a speech from Sidney Rigdon lasting three hours] President Young stated he had listened to all that had been said by the speaker….But as the subject had been broached and the people would be anxious to know something about those who would lead, he said in a loud voice: “I will tell you who your leaders or guardians will be-The Twelve! I at their head!” This was with a voice like the voice of the Prophet Joseph. I thought it was his, and so did the thousands who heard it. I was at the great meeting when the mantle of Brother Joseph rested upon Brigham Young until his whole being seemed changed and his voice was like that of the Prophet. The people around me, rising to their feet to get a better chance to hear and see, I and my little companion of the day, Julia Felshaw, being small of stature, stood upon the benches that we, too might behold the wonderful transformation, and I know that from that time on the power of that change remained with Brother Brigham Young as long as he lived on earth. The faithful and honest hearted were quick to discern the right and took up the armor of the Gospel anew, rallied round the faithful Brigham whose rightful leadership had been plainly shown to them. We bore faithful testimony to our relatives and in the spring, bid our friends [in the East] farewell to return again to our home in Nauvoo. We landed at the City of the Saints about the middle of April, on Sunday morning. But oh, how lonely it seemed, our Prophet and Patriarch was not among the Saints in person, but that day his spirit rested upon Brigham Young, and as the mantle of Elijah fell upon Elisha, so the mantle of Joseph fell upon Brigham. It seemed that the voice and every gesture was like Joseph, and he was sustained as the prophet, seer and revelator by the voice of the people. As soon as we arrived, we went right home and prepared to go to meeting for that day was appointed for us to choose a first presidency to lead the Church. The saints convened in a grove. Sidney Rigdon and his followers were on hand to contest their right to be the leaders of the Saints. At one time he was one of Brother Josephs councilors, but he was not righteous, and Joseph shook him off saying that the had carried him long enough and he would carry him no longer. Therefore, it was out of the question to have such a man lead the people. A meeting was appointed for August 8th  by which time Brigham Young and most of the other apostles had returned home. It was at this meeting Sidney Rigdon made a lengthy and tedious speech presenting his claims, telling the people what wonderful things he had planned for them. It was a solemn time for he was a man who on account of his experience and talents had been sustained as Josephs counselor by the people, although contrary to the Prophets wish for some time past, but the darkness was soon dispelled, for Brigham Young explained before the people on that day, the order of the Priesthood. He was filled with the power of the Holy Ghost. He stood before the people as the Prophet Joseph Smith often had done and we heard the voice of the true shepherd, for he spoke with the voice of Joseph. His manner and appearance were like unto Josephs and it was manifested to all those present upon whom the responsibility rested to carry on the work of God and lead the Saints. I sat in that assembly and did not realize for a time but that I was still listening to the Prophet Joseph, so great and marvelous was the manner in which the manifestation before the entire congregation was made, that when the proposition was placed before the people to decide whom they would sustain as the leader of the church, the twelve apostles with Brigham Young as their President were almost unanamously sustained. This circumstance, although the Saints were in deep trouble and filled with sorrow for the condition in which they were placed brought a great relief and gave joy to the Saints for they realized that God was still mindful of them.
. . . I was babtized into the Church of Jesus Christ of Latter-day Saints in the year 1841; emigrated to Nauvoo, Ill., in 1843 and to Salt Lake City in the year 1852. I was well acquainted with the Prophet Joseph Smith and heard him speak both in public and private many times. I was present at the meeting in the grove at Nauvoo August 8th, 1844, when Sidney Rigdon made the claim…. I saw Brigham Young, then President of the Twelve Apostles, stand up to speak to the people and he spoke with the voice of Joseph Smith; and I further declare and testify that he, Brigham Young, had the appearance of the Prophet Joseph Smith while he, Young, was talking; that I was convinced then, and have never doubted in all the intervening years from that time up to the present, that Brigham Young was the right man and the man chosen of God to lead the Church. I can bear witness, with hundreds of others who stood that day under the sound of Brighams voice, of the wonderful and startling effect that it had upon us. If Joseph had risen from the dead and stood before them, it could hardly have made a deeper or more lasting impression. It was the very voice of Joseph himself. This was repeatedly spoken of by the Latter-day Saints. And surely it was a most powerful and convincing testimony to them that he was the man, instead of Sidney Rigdon, that was destined to become the “great leader,” and upon whose shoulders the mantle of Joseph had fallen. I well remember the Sunday morning when the sorrowing saints were gathered together, in the little grove where they were accustomed to meet. Sidney Rigdon presented his claim as successor to the Prophet Joseph, making quite an impression upon the people; but Brigham Young, President of the Apostles, had just returned to Nauvoo, from his mission, in time to attend the afternoon meeting, and in a voice not unlike the Prophets, he told the people that although the Prophet Joseph was dead, Joseph had left behind the Keys of the Kingdom, and had conferred the same power, and authority that he himself possessed upon the Twelve Apostles, and that the Church would not be left without a leader and a guide. Truly the mantle of Joseph had fallen upon Brigham, and he spoke with power, even to the convincing of the saints, assuring them that they had nothing to fear, as all would yet be well, if they would harken to the Word of God, and to the counsel of his servants, and keep his commandments. In an address published in February 1845, Wilford Woodruff shared the mantle news with[“[Church] officers and members” in England by assuring them that On the second day after our arrival August 8th, 1844, we met in a special conference, all the quorums, authorities, and members of the Church that could assemble in Nauvoo. They were addressed by elder Brigham Young, the president of the quorum of the twelve. It was evident to the Saints that the mantle of Joseph had fallen upon him, the road that he pointed out could be seen so plainly, that none need err therein; the spirit of wisdom and counsel attended all his teachings, he struck upon a chord, with which all hearts beat in unison. I know this work is of God. I know Joseph Smith was a prophet of God. I have heard two or three of the brethren testify about Brother Young in Nauvoo. Every man and every woman in that assembly, which perhaps might number thousands, could bear the same testimony. I was there, the Twelve were there, and a good many others, and all can bear the same testimony. The question might be asked why was the appearance of Joseph Smith given to Brigham Young? Because here was Sidney Rigdon and other men rising up and claiming to be the leaders of the Church; and men stood, as it were, on a pivot, not knowing which way to turn. But just as quick as Brigham Young rose in that assembly, his face was that of Joseph Smith-the mantle of Joseph had fallen upon him, the power of God that was upon Joseph Smith was upon him; he had the voice of Joseph, and it was the voice of the shepherd. There was not a person in that assembly, Rigdon, himself, not excepted, but was satisfied in his own mind that Brigham was the proper leader of the people, for he [Rigdon] would not have his name presented, by his own consent, after that sermon was delivered. There was a reason for this in the mind of God: it convinced the people. They saw and heard for themselves, and it was by the power of God. I do not know if there is any one present here tonight but myself who was there at that conference. There are but few living who were present on that occasion… and when Brigham arose and commenced speaking, as has been said, if my eyes had not been so I could see, if I had not seen him with my own eyes, there is no one that could have convinced me that it was not Joseph Smith. This entry was posted in Church History, Miracles. Bookmark the permalink.